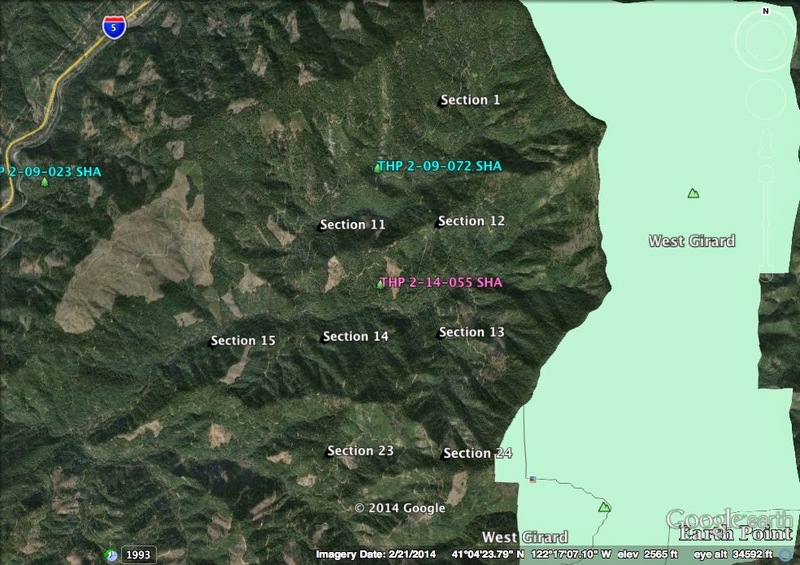 THPBlog: Sierra Pacific Industries to clearcut log on steep and unstable slopes SE of Castella, CA. Sierra Pacific Industries to clearcut log on steep and unstable slopes SE of Castella, CA. This THP is about 4 miles SE of Castella, CA and Interstate 5 at an elevation of 2,000 to 3,600 feet. Sierra Pacific Industries is planning a tractor and cable clearcut logging operation on steep slopes in mixed conifer forests. The THP area is near the I-5 corridor and drains into the South Fork of the Sacramento River which flows into Lake Shasta. Section 24 is adjacent to the West Girard Roadless Area. There is a rotational slide 75 feet by 50 feet located at the head of a steep swale in cable unit 15B, and a cut bank failure at a road crossing in section 15. Slender false lupine was found in cable unit 14B, and Shasta limestone monkeyflower was found in cable unit 15C. For spotted owl site SHA0060; this THP will remove 30 acres of low quality foraging habitat within 1.3 mi. More information is available on the THP Tracking Center website.